So I created my own forex market hours map which I want to share with you today! The timeline at the bottom of the map is based on GMT time. More timezones are available at the bottom of this post. Forex Timezones Explained You can check out this brief video and understand the essence of Forex market hours and time zones. This video is part of our course Forex Trading A-Z. Now you can watch this part for FREE! 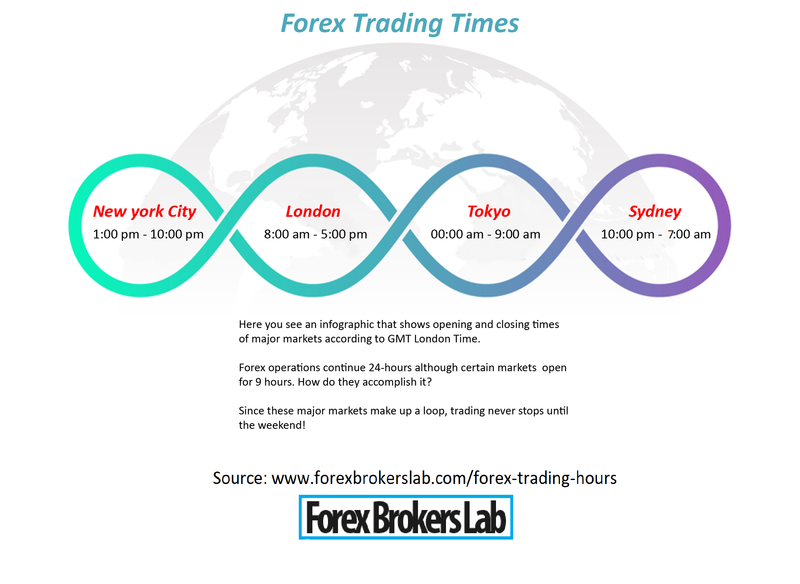 What can we see from this visualisation of Forex Market Hours? Let’s look at the sessions one-by-one and see what exactly happens over a 24-hour period on the Forex Market. It’s still 22:00 of the previous day in London when Sydney Banks open up! Their Forex Market Hours are 20:00-05:00 GMT, however the associated trade volumes are very low so it’s better to focus on the Australian session. Tokyo Session The Tokyo session follows shortly after. The Asian session starts around 00:00 GMT time, when most of Europe is in a deep sleep. This is why you often hear European traders talking about waking up at 3am to trade the Asian session before going back to bed. Also, you may have already noticed that some Forex sessions overlap quite significantly. For example, the Australian session and Asian session. You can use this to your advantage knowing that pairs like AUDJPY and NZDJPY will have the highest volatility during the Forex Market Hours of these two sessions. London Session Undoubtedly, London is the Economic Centre of Europe, and it’s just natural that the European sessions is also called the London session. Forex Market Hours for the day. This is because New York is one of the biggest financial centres in the world as well as being the East-most major city in America. What happens when you put more firewood into a fire? New York and London are the two of the World’s biggest finance centres, and the American session starts when Europe is only half-way through. Of course, you are going to get an extremely fast-paced and volatile market! In fact, I created a holistic trading strategy for the GBPUSD just based on this one fact. The strategy is called Simple System v6. 0 and you can find it in this course. It uses an extremely profitable pattern that I discovered for GBPUSD. Forex Market Hours Summary Finally, you can see that although the New York and Australian sessions don’t overlap, they follow each other back-to-back. This illustrates why the Forex market is open 24 hours a day, 5 days a week. Whatever your trading strategy, it is always beneficial to keep in mind the Forex Market Hours of the Four Forex sessions. Taking this into account will certainly give you a competitive advantage. CHOOSE YOUR COURSE NOW AND START LEARNING FOREX TODAY! Kirill Eremenko I’m a Forex Trader, a Data Scientist, an Entrepreneur, an Online Coach. I’ve been into Forex Trading since 2007 and, as they say, I’ve seen the good, the bad, and the ugly. I’ve survived the GFC and learned a lot along the way. Today I want to share all my knowledge and insights with you.